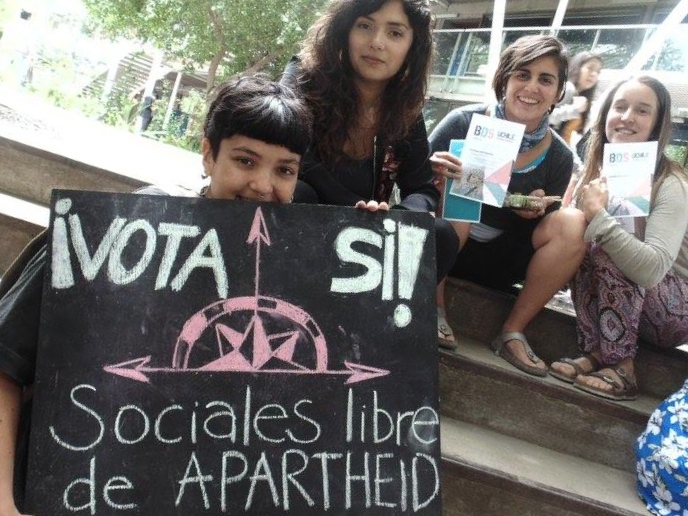 More than 90% of the Social Sciences students of the University of Chile (UChile) voted for BDS. BDS is growing at an exceptionally impressive rate in Chile. In the third academic boycott win this year alone, more than 90% of the Social Sciences students of the University of Chile (UChile) voted for BDS yesterday. After an inspiring campaign by BDS UChile, a referendum took place on the 28th and the 29th of November, in the context of the International Day of solidarity with the Palestinian People. Out of 640 votes, 591 voted for the University of Chile to cut its ties with "Israeli institutions implicated in the violations of Palestinian Human Rights". Earlier this year, Law faculty students at the University of Chile also massively voted for BDS. Just two months ago, at the Catholic University, another prestigious institution in CHile, the Students' Council also passed a BDS resolution by a large majority. "This is the second step, after the Law students' vote, to show the need to break the silence and end the complicity of Chile's academic institutions with Israel", said Dalal Marzuca, from BDS UChile. "This is part of the effort to build a truly democratic and tolerant University that is committed to human rights". "It is inspiring to see the Chilean students standing up for Palestinian human rights by exposing and acting against the deep complicity of Israeli universities in the regime's violations of international law. Palestinian students and youth are very inspired by the fact that this is the third important academic BDS success this year in Chile. Our struggles for freedom, justice and equality unite us." "Israeli universities are intimate parts of Israel's regime of apartheid, settler-colonialism and occupation. THe Chilean students, together with thousands of faculty members, students and academic association all around the world that have joined BDS, give us hope that ISrael's impunity and the international complicity it enjoys will come to an end."